Provide comfort for the family of Richard Kirkland with a meaningful gesture of sympathy. 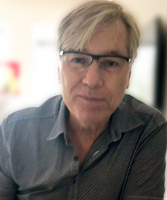 Rick Kirkland, beloved partner of Heather DeCoste, passed away on Monday, April 8, 2019. Besides his loving partner, Rick is survived by his daughter, Sacha Kirkland; brother, John Kirkland (Janice); sisters, Judy Helgeson (Gordon) and Cathy Murray (Bill) and half sisters, Sharon Davies (Sean) and Jacquey Askew (Dwayne). Rick was born at the Grace Hospital and lived his entire life as a proud native Calgarian, growing up in the Bowness area. Rick loved more than anything to be on the golf course and was known to never miss watching a Flames game. He was a passionate business owner and extremely proud of his Protech team. Rick also was a devoted partner, father, brother, uncle, friend and boss. He was a kind generous soul and loving dog owner to Spencer. The family wishes to acknowledge the nurses, staff and volunteers at the Agape Hospice for all the care that they showed to Rick and his family during this time. A Celebration of Rick’s Life will be held on Thursday April 18, 2019 at 3:30 pm at Skyline West, 200 1918 Kensington Road NW, Calgary, AB. To view and share photos, condolences and stories of Rick, please visit www.choicememorial.com. Provide comfort for the family of Richard James Erwin "Rick" Kirkland by sending flowers. I was very sad to hear of Rick's passing. I met Rick at a network meeting and quickly began using each other's services. Rest in Peace my friend.